For over 100 years the University of Maine’s Cooperative Extension outreach program and its 4-H activities are designed to get youth and adults outside, connecting to the natural world. Tanglewood and Blueberry Cove’s camp adventures and school programs are based on “Earth Connections,” nature discovery that helps youth become creative stewards of an interconnected world. 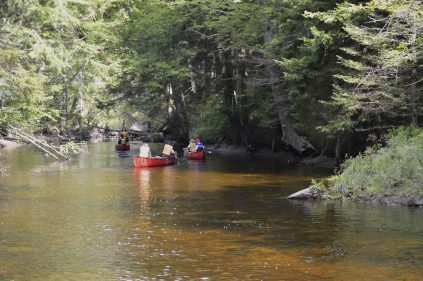 Our mission is to teach Maine youth and adults to be effective and caring citizens of the earth through affordable environmental education and nature-based experiences. Reaching over 3,500 youth and adults each year, our programming is year-round, providing affordable nature-based experiences for all ages from two locations. Tanglewood is situated on the Ducktrap river in a beautiful 940-acre forested section of Camden Hills State Park. The facility was originally constructed by the Civilian Conservation Corps in the 1930s and has 47 rustic buildings in addition to a swimming area, pond, playing field, and an extensive network of hiking and cross-country ski trails. There is also a nearby organic garden site and access to a canoeing site. Tanglewood’s summer camp includes day and overnight camps, a teen leadership program, and a trips program. During the spring, fall, and winter the facility hosts a variety of school programs and vacation camps. The facility is also open to rental by community and environmental organizations. Blueberry Cove is situated on a hilltop overlooking the beautiful Tenants Harbor in the town of St. George. Prior to Tanglewood’s acquisition in 2005 the site had been operated as a private summer camp since 1949. The site features 1,400 feet of protected beach and salt marsh, a dock, garden site, spruce forest, and a meadow. 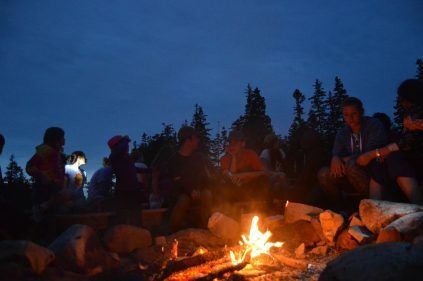 Blueberry Cove’s summer camp includes day and overnight camps, and sailing programs. Its extensive gardens are host to education programs through the spring and fall. The facility is open to rental for events.